Spoken to His disciples, and possibly heard by some of the multitude with Him, Jesus makes a promise that we would do well to understand. There are two things that stand out for me in this verse. 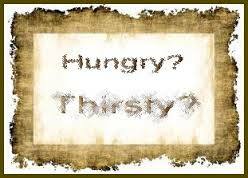 Being hungry and thirsty is something we seek to avoid, especially in modern America. Pursuing righteousness is way down the list of dreams, desires and destinations. I realize, of course, that the idea of “hungering and thirsting” is not foreign to us. We are told on a regular basis to stir up the passionate pursuit of our goals. That is what Jesus was referring to in His comment. Make righteousness your goal. Pursue it with intensity. You will achieve it. Sorta kinda depends on whether we read and believe the Bible as to what our definition of righteousness might be. Even then, it is not a guarantee that we will be going after that of which Jesus spoke. In the sermon on the mount, the mention of “righteousness” first occurs here in this verse. It is also mentioned in verses 10 and 20. We are told to hunger and thirst after righteousness, which must exceed that of the scribes and Pharisees, and that we will be persecuted for such a pursuit. That gives us a clear understanding of what we are to achieve, especially in light of exceeding the righteousness of the scribes and Pharisees. A good Pharisee knew not only all the laws of God, but also every interpretive application of each one. A modern application might make this a little more clear. And who could recall ALL of the various laws and their myriad applications? Yet, the Jews and many Christians believe that righteousness is found in the keeping of the laws of God. Paul uses the better part of his letter to the Romans to show how trying to keep the Law of Moses is not only futile, but can never bring about the righteousness that God desires. You cannot live long enough to fulfill all the commands of the Law of Moses, nor could you fulfill all the commands contained in the Bible. It is simply not humanly possible. Therefore, the hungering and thirsting after righteousness of which Jesus spoke is NOT found in trying to memorize the Bible, or keeping rules and regulations imposed by you or anyone else. It is the pursuit of God, plain and simple. And in that pursuit, you will find God and His righteousness—and YOU will become righteous. Hungering and thirsting after righteousness is a good thing (or Jesus would not have said it), but we must know and understand what it is that we are going after.